Are we nothing more than a collection of our memories and experiences? This is one of the questions Jane asks in this week’s episode of Jane the Virgin, because Jason is surely nothing like the Michael she and we remember. In fact, Jason...is kind of terrible. Last episode, we watched him start to catch feelings for Jane, kiss her despite knowing she was in a relationship, and lie to her about the state of their divorce papers. Now, he refuses to sign the divorce papers at all unless she goes on a date with him first, once again ignoring the fact that she’s in a relationship with Rafael. Jason is the obtuse, self-centred, obstinate man that every woman hates and has had to deal with at some point. He ignores Jane’s own feelings, repeatedly asks her out after she says no, makes her feel uncomfortable, and refuses to take no for an answer. (In an episode that also touches on bodily autonomy and consent, this hit particularly hard.) Every one of their interactions made my skin crawl. Eventually, Jane caves and agrees to go fishing with Jason in exchange for the signed divorce papers. (Even though Michael knows she has no desire to go fishing, with him or otherwise.) While there, he imposes several rules on her, the worst of which is that she must control her facial expression and pretend like she’s enjoying herself. (Anyone else reminded of creepy men asking women to smile?) Also, the date isn’t over until Jane catches a fish, which potentially traps Jane, who doesn’t want to be there and doesn’t want to learn how to fish, against her will for a number of hours. In the process of teaching Jane, the two have a moment that could have been construed as romantic — and would have been, if Jane had still had any feelings for Jason or the Michael she remembered. Instead, as she confesses to Petra, the moment made her realize that those feelings were gone, and Michael now feels like a stranger to her. So Jane makes the decision to take Jason up on his offer to go back to Montana — or, at the very least, let her get back to her life before he showed up. The episode ends with Michael regaining his memories of Jane, after a fall of ceiling dust like snow triggers a remembrance of their first kiss. But is regaining his memories enough to bring the Michael of old back? He’s not the person Jane knew four years ago. The years he spent being Jason aren’t just gone. The broader personality differences that draw a line between Jason and Michael can’t just disappear or be happily reconciled. And Jane also is not the Jane of four years ago. She’s been changed by the loss of Michael and everything else that’s happened to her since then — becoming a published author, watching her son grow up, falling in love with Rafael, her mother’s cancer, to name a few. Alba, when Jane talks to her about how Jason is no longer her soulmate because that connection is gone, offers an interesting perspective: everyone has a soul, but the concept of soulmates itself is reserved for telenovelas. This is something Jane may have to come to terms with over the rest of the season: while Michael may have been a “soulmate” for her back when they were both the people they used to be, that’s no longer the case. One of the best things to come from this whole Michael/Jason mess is a breakthrough in Jane’s relationship with Petra. Initially, they fight over how to parent their children (since Mateo and his half-sisters are currently not getting along and wreaking all sort of havoc on the hotel), which leads to Petra opening up to Jane about how she’s been feeling left out — Jane went to everyone but her when Jason first showed up in town. While she and Petra may not always like each other, they definitely love each other; the bond they forged while Rafael was in jail is unbreakable and, as Jane realizes, very much like a sisterly bond she never had growing up. And as Petra gives Jane perspective on what to do about Jason, Jane convinces Petra to reach out to JR and see if she might be willing to talk. Coming to see Petra as a sister forces Jane to realize one more thing: she wants to have more kids. It’s something she brings up to Rafael, and he’s also open to the idea of adopting at some point in the future. I love watching these two talk about their future, even though their engagement is still up in the air. Meanwhile, Rogelio is on the wrong side of the wage gap in Hollywood when he finds out that his costar River Fields is making twice as much money as him on their telenovela. Xo educates him on how women traditionally make less money than men, especially in Hollywood, and how it’s nice to see a woman winning that war for once. After an unfortunate incident in which Rogelio kicks River in the head, temporarily paralyzing half of her face and forcing her to act only with the side that’s unparalyzed, Rogelio realizes that River is worth every dollar she makes. Aside from being the bigger name and the person who’s going to draw American audiences to his show, she’s a brilliant actress. But he also realizes that just because River doesn’t deserve to paid less doesn’t mean that he doesn’t deserve to be paid more. After all, The Passions of Steve and Brenda is his show; he fought for it for four years, he’s the reason it’s being made for American television at all. And, as Rogelio learns, the pay gap in Hollywood disproportionately affects people of colour. Xo calls River and explains Rogelio’s side to her, and River decides to throw her support behind him, which culminates in Rogelio getting bumped up so they make the same pay. But what seems to be a good-hearted act is actually anything but, when an article comes out in People magazine about how River “lifted up” her costar. Of course, in their ongoing battle that vacillates rapidly between friends and enemies, that makes Rogelio anything but happy. Conspicuously missing from this episode was Rose. After everything wrapped up relatively well — Jason is leaving, Jane and Raf live together, and Rogelio is being less dramatic on set — I’m sure she’ll be back soon to wreak havoc in any way she can. 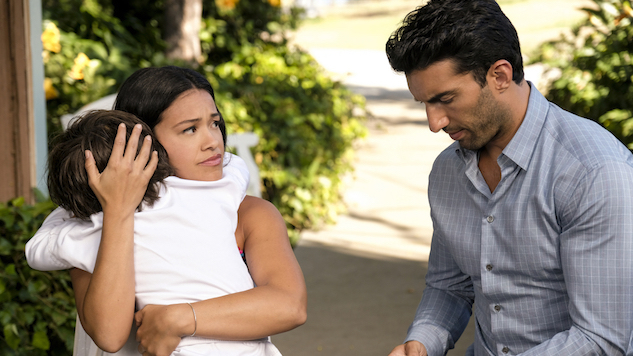 Feb 16 Jane the Virgin 4x10 "Chapter Seventy-Four"